My daughter had a half yard piece of black and white checked fabric she had used in the center of a table for our annual AWANA grand prix (like the Boy Scout’s Pinewood Derby). When they canceled any future races it was her job to find new homes for all of the supplies--and my Operation Christmas Child shoebox stock benefited. shoebox treasure. I was able to make 16 bags -- so I have purchased additional cars to fill them. As most of you know I have sewn dozens, okay, hundreds, of Pillowcase style dresses for both Operation Christmas Child shoebox gifts. Since each dress uses bias tape I have amassed a nice selection of bias tape scraps—perfect for making the casing. I love the colorful touch on the black and white. The little drawstring is perfect to hang on a boy's wrist. We will tuck two little cars in each bag – one for each hand. 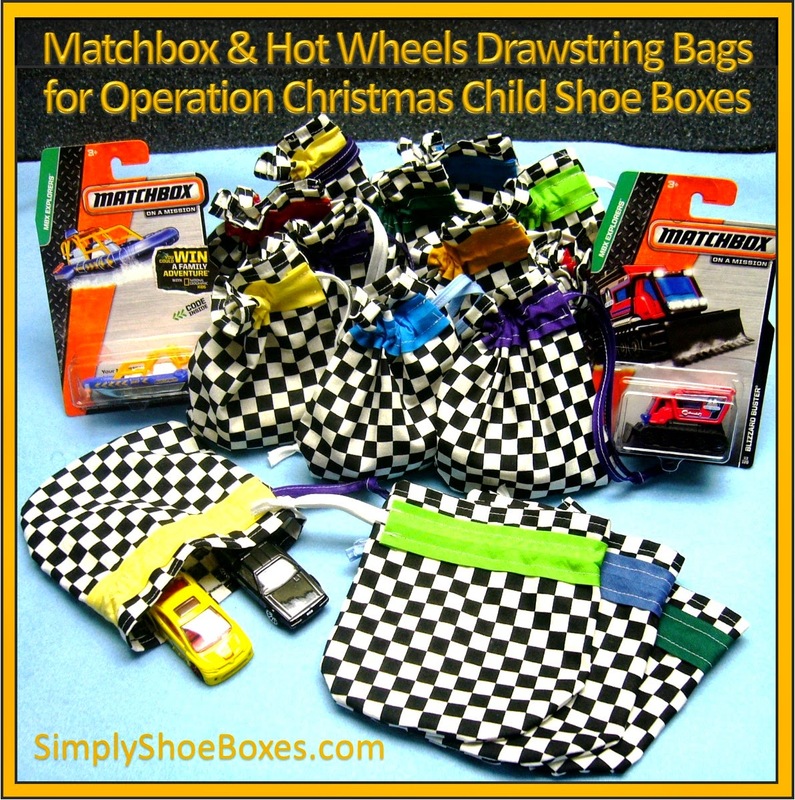 If you'd like to make little drawstring bags for your shoe box goodies I did a tutorial for a basic one earlier. You can find it here: How To Sew Small Drawstring Bags. The bias tape addition is not in that tutorial, but you can find how I did it on my full size shoe box drawstring bags here: Using Bias Tape as a Drawstring Casing.